Hi everyone! Our Holiday Sale is in full swing, and we’re kicking off Week 2 with a brand-new lineup of limited-time deals. 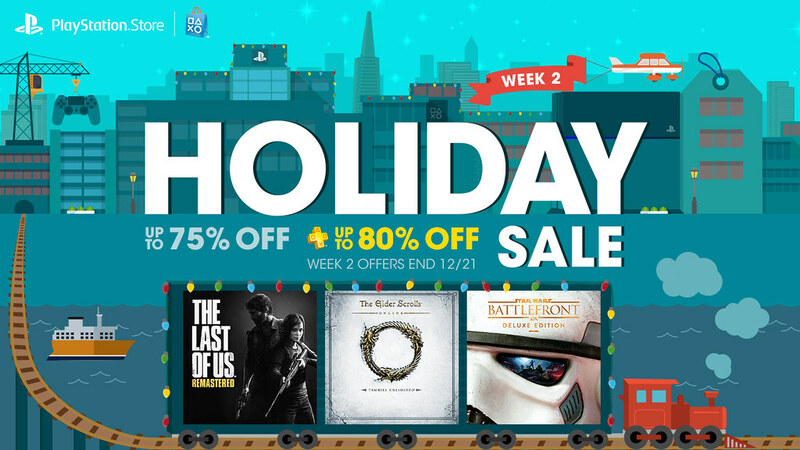 Starting right now, save up to 75 percent on some of the season’s top games and movies. PlayStation Plus members save up to 80 percent. Head over to PlayStation Store to pick up titles like Star Wars Battlefront Deluxe Edition, The Last Of Us Remastered, and The Elder Scrolls Online: Tamriel Unlimited Premium Edition, as well as films like Prometheus — all on special discount this week only. Check out the full lineup below. Holiday Sale Week 2 ends Monday, December 21st. But make sure to circle back next Tuesday to check out the goods Week 3 has in store. What’s made your list so far? Catherine™ Is also on sale. why is it not listed on the holiday page. I just happen to check out what the price of it and noticed it’s half price. My backlog continues to grow! I don’t know how I’m going to complete all of these games in time for the madness which is 2016!! I’ve been mulling over the idea of buying it. Still on the fence. Lol. Guilt Gear Xrd -SIGN-? I know it is an outstanding game (having played the demo), but my backlog is really large at this point! I’m really on the fence as well! Just bought Guilty Gear!! I could not resist haha! I just bought it as well — I too could not resist!! I listened to the end credits theme on youtube, and it reminded me of my time with the demo having beat the game with Sol Badguy. Man… What an amazing game! And the ending theme is truly beautiful. Nope. To me, that’s a reason not to buy them anymore. It’s also the reason why I won’t be buying the ones for PS4. Same goes for Ps One classics now. It is just not a fair way to do business in my opinion and has made me lost all the interest in purchasing classics from Sony at all. Nope, just buy it again and again. I never bought any PS2 classics on PS3….they looked like poop anyways. At least on PS4 they’re upscaled and have trophies. Nice sale. Unfortunate that the Vita version of Final Fantasy X/X-2 isn’t on sale as well – I’d love to have that digitally on my system instead of having to switch out my physical copy. I’ve noticed you don’t list Soldner-X2 for PS Vita as being on here but it’s on sale right now, which I just bought. I’m wondering, Q-Bert is on sale as well as a bundle on PS4, on the shop item itself it lists under the details as also including the Vita edition, but then as the compatibility listing it only lists PS4, and is therefore not searchable by sorting the sale using Vita. Is this a mistake of the description, sorting, or what? Developer of Bombing Busters speaking here – YES, Bombing Busters is compatible with both PS4 and Vita, and buying either version will give you access to the other version. Although, at this point in time, for some reason beyond my control, only the PS4 version is discounted. So the PS4 version is the one to buy :). It’s so unfair for the people that paid a lot for the battlefront DLC.., not it’s on sale and it didn’t even came out yet. If you do the math, the DLC is carefully kept at or around $50 (the same price it has continued to remain). Does anyone else on their PlayStation 3 see that they are advertising the last of us and guilty gear Rd sign for free? If you go where it says welcome and then click on the amazons holiday week sale 2 and from there scroll to the right and it shows those two games are free for plus members, but when you click on them they ask for money. Isn’t that false advertisement? I called Sonys customer service line and they denied it. I also offered to email a screenshot, they said they couldn’t accept pictures and that they were sorry that I misunderstood something. Am the only one seeing that on the PS3 market? I don´t but I saw some time ago an ad where they said Uncharted 3,Little Big Planet 2 and XCOM were free for plus members (and i have seen the same ad several times) which was, of course, a lie. I did not even bother to ask Sony, they are known for not giving a **** about costumers. They did the same thing a couple of months ago. Tricked me into subscribing to PS Plus, lol. I didn’t have a PS4 at the time so it was sort of useless. Answer: No. Unless they make some kind of PR release (post on this blog) that goes unchanged, or release an advertisement that shows up on websites/in print, it is not being “advertised”. It’s simply an incorrect graphic. Way, way too many people like to try and jump on this stupid “false advertising” train, when it’s really a very narrow street that rarely gets travelled. As you’ll see, having an incorrect price posted one place and the correct price posted upon following a link wouldn’t fall under any of the categories related to false advertising. It’s a human error, one that usually gets corrected as soon as possible. ^ – That would be a proper reply if the attitude encountered when pointing out these “mistakes” were normal. Example: “Oh, I see it now. Thanks for letting us know. Sorry for the confusion.” No problem, right? If anyone here thinks they have grounds for a serious lawsuit upon finding an incorrect price mentioned online…yeah, not gonna happen. I think most people just want to be treated reasonably as a customer. That doesn’t always mean giving everyone what they want (in this case, the “advertised” price). Note: “As soon as possible” is a very shopworn phrase. It’s *possible* to make a list of all the places online where something is advertised and remove all of them once circumstances change. That way nobody sees lists of Plus games that are months/years out of date. By the way, I’m sure Sony staff does things like that all the time: fixing store and website errors, etc. Good for them. But we don’t need the attitude from them or their sycophants when things go wrong. Some of these prices are just not low enough as you can buy them at retail or online for less. Both FF type 0 and FFX/X-2 have been $20 or less the past month or so. I’d like to see The Vanishing of Ethan Carter on sale for once. Been really wanting to play that game. Hopefully you guys include it in the next 2 weeks of sales. I’ve gone all digital this gen and it’s a little disappointing to see that even a PS+ sale on digital copies is still more expensive than a physical copy. yes those two were $20 in canada but that was only for black Friday as there all back up to normal prices so thats a good deal for FF games , alot of games were cheaper because the sales this past month but that was a different sale it was not a regular price change so it does not matter . Can we get Netflix support on the PS TV? Can we get more games supported on the PS TV? Can somebody organize the store on the PS TV? This is the first Sony console that I am actually disappointed with because of the lack of support. Also why are Comcast customers not able to use HBO GO? I know it’s not as good as Sony providing better support for the PSTV, but there is a very easy hack you can do to make many Vita games work on the PSTV that don’t currently, as well as Netflix. Just google Playstation TV email hack. Kinda interested in Final Fantasy Type-0 HD, but I have mixed feelings about it based on what I’ve seen (especially at $36). The Last Of Us would be a definite buy, if the sale was a little better. $43.99 in Canada. Cheaper to buy it pre-played. Hopefully next week brings something merrier. Like many others, I paid $25 for The Last of Us when it was first released. Granted, it was a trade-in offer, but $35 for PS+ is an absolutely horrible sale for that game now. Should be $20-$25 for PS+, $30 without it. The mobile store says The Crew Wild Run Edition is on sale for $14.99, but the web store says it’s just The Crew and Wild Run Edition appears to be its standard price. I wish DLC/season passes went on sale when the games did! This comment is for HellBringer1975, for some reason I can’t reply on his comment, but I’ve got MANY refunds in the past for several games and never had any hiccups with Sony about that, they’ve refunded Destiny when I bought it on the PS4, so I can buy it again on the PS3 and get the PS4 version for free, also they’ve refunded Metal Gear Solid 5 on the PS3 and allowed me to buy anything I want, the only thing is that they don’t refund on your bank/Paypal account, they give you a credit on the store. So far I’ve got 3 refunds for newly released games. Thank you Sony and to the publisher Idea or Compile Heart for letting Omega Quintet on sale. I never got the chance before to buy this game when it was on sale a few months back and regretted wasting that opportunity. I really wanted to play this game for months now. Thanks again. Divinity Original sin Enhanced edition seems like the only true sale here? And only by like $5. Seems like these weekly sales are turning from something to be excited for into “well, maybe ill grab one game for $5 off”. Not really worth paying attention to. Is it sneaky of them to list the PS2 version of Bounty Hunter as being on sale? Clearly the intent was to capitalize on the recent announcement of the upresed game. For the less observant, take note that this is NOT the PS4 version, and these games are not currently cross-buys. Bad sale…but the only thing that matters…Metal Slug 3 is mine!! ha finally. I can confirm this. On the mobile Store indeed the WILD RUN Edition is $14.99 (with PS+). But when you click on it, it´s only the base game. As for your question, Wild Run is a new DLC with monster trucks. But also the base game received a huge update with graphics and gameplay improvements. It also says Wild Run Edition in the CART. So maybe it is ? I can confirm that it’s not the WR edition, despite what it says. What makes matters worse is that the game still has a Wild Run main menu, AND lets you do the introduction events. But once done that, it’ll prompt you to purchase WR in order to continue. The base game is still well worth $15. I put nearly 200 hours into the PC version. Bought Galak-Z which is actually excellent and bought Metal Slug which is pretty cool. Considering Bedlam. Hi there , does Type 0 HD comes with FFXV demo? I remember buying newly released games for more than half price discount during last year’s sales: Alien Isolation, shadows of Mordor, the Evil Within and many others for $25. So far there has not being that many good deals this year. I am personally waiting for a good deal on until down this time -As it is the only exclusive I do not have yet. Not really interested on the rest, do not feel like buying much from Sony lately, luckily these prices help… 25 dollars for newly released games would have been way more difficult to resist. I’d go for PS2 classics if they were cross-system compatible on PS4, but they’re not, so I’ll just pass. I’m happy to see Deception on sale for Vita. Every time in the last year it’s been on sale for PS4 it has not been on sale for Vita which is what I would prefer to play it on. Keep pushing that ESO too; PC and XB1 players got to try it for free last weekend yet PS has consistently had it on sale for what seems like months now. Like the guy above, I would also jump on some of those ps2 classics on ps3! However, I no longer have confidence that my future purchases will carry over to future platforms, so pass for me. Please add a discount program or something! Hmm… seems like my comment yesterday was removed or missing for another reason. I don’t see a reason for removal. I simply stated that last week, I truly had to resist a couple really stand-out sales… while this week, nothing stands out to me. there are names I recognize and there are prices that aren’t bad but nothing leaps out, punches me in the face, and takes my money. I wanted to play this one for a while! I wished FFX/X-2 remaster would have a better price… I already bougth and finished the original, don’t make us pay the price of a new game for a remastered title… Thats lame. I would GLADLY pay 15$ for it, that is its worth! Put it that price and I’ll buy. Guilty Gear is *such* a great game! It’s a fighting game with tremendous gamplay depth, not just in timing, but in complexity. And the characters and art style are top-tier — beautiful! And as an added bonus, there is a over-arching story as well. Strangely, it reminds me of the Street Fighter anime… The story may not be deep, but it adds welcomed context to the world! The Vita keeps getting shafted. I know Sony’s done supporting it but come on! Give us the games we already own. the prices DON’T match my shopping cart~! is it cause im in canada and SINCE WHEN is it DIFFERENT!???? Stop selling us games three times, you are not Rockstar. is the wild run a full game or i have to buy the base game in order to make it work , I’m confused some plz explain for me …. wierd WR is at 15$ and the base is 39$ that makes me think twice be4 purchasing . When is Killing Floor 2 being released? I really want to play Racer Revenge on PS4 with upscaling and trophies! Are these going to be released on PSN? Or are they exclusive to the console bundle? Would be silly not to sell the upgraded versions! I’d love if someone from Sony could answer. Thanks. listen, im not trying to teach u guys ur job but please compare ur sales with eu psn store sales. eu psn store sales are way better and will always be better. please just put some good and new games on your list. Would love to use my 10% off from the December 5th deal on these but here we are 2 days after we were supposed to have our code and no codes.